My dad was hit and killed this week while bicycling near his home. My husband wrote the following beautiful tribute to my dad’s beautiful life. In the How to Manage Your Money Bible study by the late Larry Burkett, while discussing wealth and stewardship, Larry noted that, once we leave this world, what we will be in eternity is decided forever. And the only things that will matter are the things we did in the name of Jesus. So often in his sermons, teachings, counseling sessions, or simply everyday conversations, my beloved father-in-law, David Fitzpatrick, would urge us to say the things that Jesus said, and do the things that Jesus did. Jesus was his standard–always. David didn’t simply tell others to do and say such things, he modeled this behavior with his own life. Whether giving away grocery bags full of items that couldn’t be purchased with food stamps (soaps, toilet paper, toothpaste, and the like) at one of the Gainesville area housing projects (a service he performed for well over a decade), preparing and delivering sermons, counseling young couples looking to marry, helping to plant churches in South America, supporting Choices Pregnancy Care Center, offering prayer to strangers in public places, being overly generous to those who waited his table in restaurants, keeping his grandchildren while their parents worked or ran errands, pouring life and truth into the middle school students that he taught, and on, and on, and on, David was very busy being the hands and feet of Jesus. 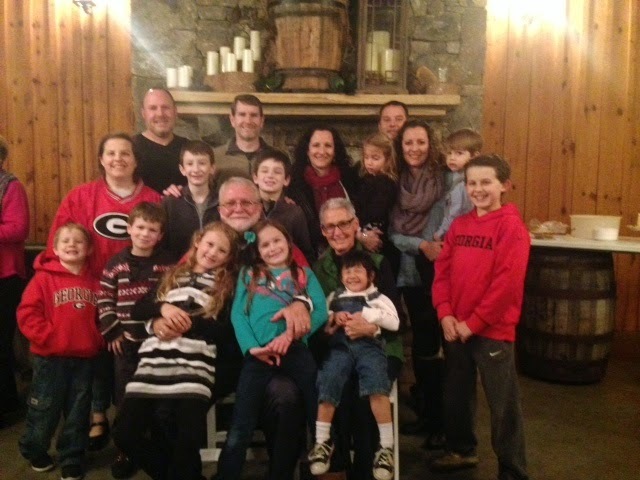 “Papa” with 3 of his 4 children (along with their spouses) and 10 of his 11 grandchildren this past Christmas. David and Margie went to their grandchildren’s birthday parties, baseball games, karate tournaments (he and Margie traveled to Ellijay this past weekend to watch Caleb, Jesse, and Caroline compete in karate), piano recitals, horse shows, and the like. However, after his relationship with his creator and Savior, David was most devoted to his wife Margie. This devotion was clear to all of us who knew him best. This is perhaps his greatest witness. Additionally, David LOVED to “get lost” in musical worship. He craved it. It was a point of emphasis while he was a pastor on this earth. However, he knew well that a life of worship went far beyond the songs we sing on Sunday morning. This life of worship would certainly extend to showing love and forgiveness to the man that struck and killed David as he rode his bike near Braselton. This man must answer to the law, but in no way would David have us wallow in hate or anger in this tragedy. In fact, David would have us pray that God would reach down into Mr. Bowers’ life and bring hope and healing. Thank you, Papa, for a life full of love. I, and many others have reaped much, and will continue to do so, from all of the love that you’ve sown. This is only goodbye for now. All who know Jesus will see you again. Come quickly, Lord Jesus!!! This entry was posted in Christianity and tagged Alcohol, drunk driving, forgiveness, God, Jesus. Bookmark the permalink.